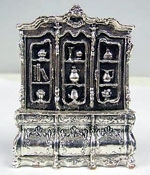 cabinet miniature A charming artisan 925 sterling silver (NOT silver plated) cabinet miniature. Highly sought after by collectors this miniature cabinet is superbly design in an antique style. It has 9 compartments with books, vase, pot, fruit, etc. Its wonderfully ornamented with superb foliage decorations. This item was made in the electroforming method. Measurements: Height: 3.6in. / 9.144cm. Width: 2.7in. / 6.858cm. Thickness: 0.8in. / 2.032cm. Weight: 56.8gr. / 1.826oz. Marks: 925 for sterling silver.